Annie Gerhart’s mother was the first to have an inkling that her daughter would thrive as a nurse. But it was only after watching “Emergency!,” the 1970s TV show about a group of first responders whose stories collide at Rampart General Hospital in Los Angeles County, that Gerhart decided she wanted to be in emergency medicine. “I wanted to be like Dixie McCall [the show’s head nurse]—she didn’t take anything from anybody,” said Gerhart. The real Rampart General Hospital was actually Harbor General Hospital in Torrance, Calif., a jaunt up the 110 freeway from her hometown of San Pedro. Fiction or not, what happened inside the walls of Rampart was inspiring to Gerhart. She craved the fast pace and the drama. She was a nursing assistant in high school when she decided to apply to PLNU because of the nursing program’s esteemed reputation. In college, she thrived. During her college years, she also held a preceptorship—a mentoring experience with a practicing physician—at Sharp Cabrillo Hospital (now Sharp Memorial Hospital) in San Diego. She graduated in 1983 and took her first full-time job on the night shift in Sharp Cabrillo’s emergency room. “I received excellent teaching from nurses who really cared about people,” said Gerhart. The very next year, the trauma system as it is known now found its start. The timing was apt—Gerhart had become a trauma nurse and the hospital had just completed a helipad and received its designation as a Level II Adult Trauma Center. Gerhart got in on the ground floor. But in 1988, Gerhart had grown professionally and felt called to move on to field service with Youth With A Mission’s (YWAM’s) Mercy Ships, an international nonprofit that operates hospital ships around the world, offering free health care and community health and development programs. Gerhart, along with missionary friend Sarah Pannell, spent time reviewing what was being done in the field with relief and development. For six months, Gerhart and Pannell focused their time in sub- Saharan Africa, but also visited countries such as Thailand, India, and the Philippines, traveling to YWAM-Mercy Ships clinics to review and report on procedures and find out how clinics needed support. They spent time witnessing the work of relief and development projects in different areas—vaccination programs, health care schools, rural clinics, refugee hospitals, TB clinics, teenage pregnancy support programs, and other health services. Many places were thriving. For example, one such clinic, when asked how they were keeping vaccines chilled, showed Gerhart how they had rigged a system of solar panels to properly do the job. “We became the feet of the organization in places the organization couldn’t physically be to help and to check in,” said Gerhart. Even though she eventually had to return to the U.S., her time abroad left a lasting imprint on her life. She continues to support missions, medical or otherwise. She also visits her brother Jay and sister-in-law Sarah (strangely enough, the same friend with whom she traveled in 1988) every two years or so; they serve as missionaries in South Africa and Zimbabwe. On one such trip, she taught a group of nurses on pediatric trauma in Soweto, a township in the city of Johannesburg, South Africa. While Gerhart dove back into her work at Sharp, San Diego’s Rady Children’s Hospital was in the midst of building a new emergency department. Previously, any Rady patients in need of emergency care were transported to Gerhart’s hospital, Sharp Memorial—the only pediatric trauma center in San Diego—where a team from Rady would travel to the ER to take care of critically ill children. So in 1993, Gerhart left Sharp Memorial to join the team tasked with starting Rady’s own onsite trauma department. While at Rady, a doctor there encouraged Gerhart to go back to school, so in 2003, she earned her master’s from the University of San Diego to become a nurse practitioner. She was ready to take her career to the next level, but that same year, she encountered her own medical emergency. After speaking at a PLNU Homecoming nursing alumni breakfast, a friend told her she looked abnormally pale and tired. Gerhart dismissed it, but noticed she began wheezing that same week and decided to go to the hospital for a chest X-ray. She was diagnosed with a chest mass and later cancer, a rare germ cell tumor in her chest cavity called dysgerminoma. She was ordered to begin chemotherapy a week and a half later. “I learned a lot about being on the other side of the needle,” she said. After five months of chemotherapy, she was reenergized and ready to go back to work, but there was no job left for her. Her previous employers had given away her job, saying they didn’t think she’d make it. She has taken that shift in perspective seriously. With all the skills and expertise she’d gathered in her field, Gerhart could now add empathizer to that list. Going through such a terrifying experience allowed her to understand the emotions of her patients better than any training could teach. Gerhart is currently helping her neighbor’s father walk through his own cancer journey—accompanying him to the hospital as an advocate and a listening ear. When she was ready to begin working again, it didn’t take long for a new opportunity to arise. Gerhart connected with a Navy lieutenant through a mutual friend soon after getting the news about her job at Rady. During their meeting, he introduced her to several other ranking officers and asked her if she could start working at San Diego’s Naval Medical Center emergency department in three weeks. She has now been an emergency nurse practitioner for the Navy for nearly a decade. In addition to her full-time work, Gerhart also just finished her 24th season as a nurse for the San Diego Padres. When she joined a group of nurses at the Padres’ former home at Qualcomm Stadium, there was one room for basic first aid care. Now at Petco Park, the group has oversight for “any medical emergency in the footprint of Petco Park” and is fully ACLS (Advanced Cardiovascular Life Support) capable. Gerhart continues to work once a week at Rady and is also a teacher. She travels around the country training nurse practitioners and is consistently precepting other nursing students at her site, and she is also an adjunct professor at PLNU, a job she particularly enjoys. She works with students in their junior year, teaching them pediatrics. 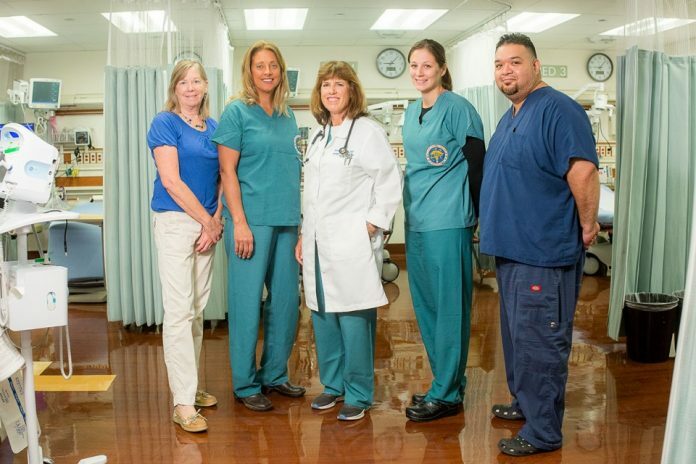 Once a week, she takes students to Rady for their clinical training. 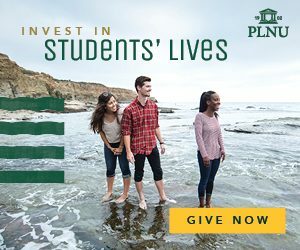 Gerhart has served on PLNU’s Alumni Board intermittently for 20 years and is chair of the Nursing Alumni Auxiliary. It can be said about Gerhart that she has done pretty much everything one can do in the emergency field—she even says so herself. Since she couldn’t have predicted what her career would look like today, she lives and works with an open heart. Sharon is the director of Marketing and Creative Services at PLNU.